ChiIL Live Shows caught Othello: The Remix, on their opening night in Chicago and LOVED it. This production is so relevant and accessible, it may just turn on a whole new generation to the genius of Shakespeare. Stick this show on the top of your must see list. We're also stoked to see The Q Brothers again at Kidzapalooza, where they're annual regulars. We heard from some insiders at Chi Shakes that this show was originally written for the London 2012 Cultural Olympiad’s ‘Globe to Globe’ festival at Shakespeare’s Globe where countries were given Shakespeare's plays to produce in a number of languages. Originally, the US wasn't going to enter as England had English covered. But the fest made a special exception and designated Hip Hop as it's own unique language... and a hit was conceived! Othello: The Remix rocks! Recommended for mature tweens and up. Click here to check out ChiIL Live Shows & ChiIL Mama's past coverage. 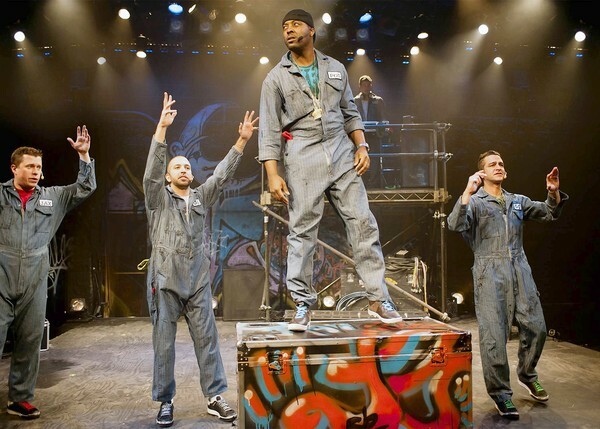 Chicago Shakespeare Theater’s (CST) Othello: The Remix, the 90-minute hip-hop adaptation of William Shakespeare’s tragedy, spun out and lyrically rewritten over original beats, has been extended a second time through July 27, 2013. Written, directed and with music by the Q Brothers, Othello: The Remix is receiving rave reviews from audiences across Chicago, playing to sold-out houses and nightly standing ovations. The high energy, cross-genre production is stimulating theater attendance from under-represented audiences in Chicago with noticeable increases in multi-generational and culturally diverse audiences. The production continues to break records for Chicago Shakespeare’s longstanding CST for $20 program, which offers $20 tickets for CST productions to students and young professionals under the age of 35. Following the extended run of the American premiere in Chicago, Othello: The Remix will return to London (where the production first performed last fall as part of the London 2012 Cultural Olympiad’s ‘Globe to Globe’ festival at Shakespeare’s Globe). The three-week engagement at London’s Unicorn Theatre will take place September 11–28, 2013. Chicago Shakespeare’s full 2013 summer programming schedule also includes: Piccolo Teatro di Milano’s Inner Voices from June 25–29; Shrek The Musical from July 13–September 1; Chicago Shakespeare in the Parks performing The Comedy of Errors from July 26–August 25. The Q Brothers, GQ and JQ, are siblings born and raised in Chicago, who started their professional careers in the off Broadway hit, The Bomb-itty of Errors. Commissioned by CST and written, directed and with music by the Q Brothers, Othello: The Remix is the first Shakespeare tragedy and second collaboration with CST Creative Producer Rick Boynton. Boynton was also involved in the creation of the Q Brothers’ award-winning CST commission, Funk It Up About Nothin’, which received critical acclaim in its world premiere at Chicago Shakespeare and subsequent international tour to New York, Australia and the UK. In addition to the Q Brothers, the cast of Othello: The Remix includes Jackson Doran and Postell Pringle and DJ Clayton Stamper. Othello: The Remix is produced by Chicago Shakespeare Theater and Richard Jordan Productions Ltd.